I love "nature fights back" movies. There is something about animals, bugs, and plants fight humans that always puts a smile on my face. Black Sheep doesn't fall into this category of movies and because of that I was a little let down. The Story: After 15 years of being away from the family farm, Sean returns home to sell his stake of the farm to his brother. Sean has a fear of sheep and returning to the farm is very difficult for him. After selling the farm, the sheep start attacking people. Sean finds out that his brother has been doing experiments on sheep to better there DNA. Because they have been dumping all the test subjects done a hole at the farm, the sheep have developted a taste for blood. 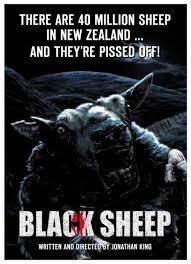 The Skinny: Black Sheep is notable for two things: killer sheep and Weta Workshop. Of course the killer sheep is the main draw, but Weta doing the effects is just as much a draw. Weta Workshop is the effects house that Peter Jackson founded and they have done some incredible work. They have done everything from the Lord of the Rings trilogy to Avatar, so you know that the effects are going to be good. And they are very good. Using a mixture of CGI and old fashioned practical effect, Weta has created some truly amazing effects. The story, however, isn't that great. It doesn't have to be when you have killer sheep, but going down the road of science gone wrong is not that interesting. I wished that there was no explanation for why the sheep are attacking. It would have made the movie a lot scarier. The film was shot in New Zealand and it looks beautiful. The greens and yellows of the grass really pop out and the red of the blood is dark and colorful. The interiors are dark and univiting. The mood is set early on in the movie. This is not a movie that is to be taken seriously, but it is played straight. It the actors and the filmmakers were winking at the camera the tone would have been ruined. Black Sheep is a delight for horror fans. It has enough blood and guts for two movies and the comedy is well handled. The filmmakers seem to be going for a Bad Taste vibe and for the most part they achieve it. It's just too bad that they that they had to give the sheep a reason for killing, as if they needed a reason in the first place.